Well, this is where I haven't been in a while. The month of June is going by a little too fast for my liking. I've been having a roller coaster ride with my emotions lately, feeling a little overwhelmed to be honest. And, with a few too hours in a day, and not being as organized as usual, I have been a little frustrated to say the least. I don't even know where to begin. My yard work has finally been completed, my parents returned from their UK adventure vacation with many great memories and new friends made, I am no longer dog sitting for them (and I'm a little sad about that) my kids activities and field trips, sports etc have increased for this month, as everything winds up until the next school year, my parents hit a deer and wrecked their vehicle on their drive home from here, so I ventured to go and retrieve them out the highway and they stayed one more night at my place while they picked up their rental vehicle and repacked it with their luggage, etc...(no one was hurt or injured, thank goodness) my hubby bought another new boat after selling his old/new boat which he bought only weeks ago. 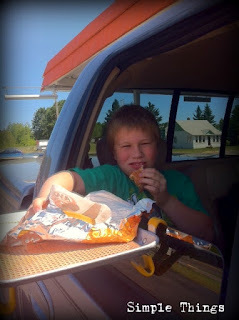 he had to have the tray on his window, in the back seat of the truck. Probably his favourite part of the whole trip. We carried on and stopped at some shops that I fell in love with. Vintage, junky, antiquey, homemade goodness all in one. One most awesome antique store outside some small town, that I didn't even attempt at haggling with his prices, I had a few moments that I thought I should pay him more money, but of course thought again, heehee. 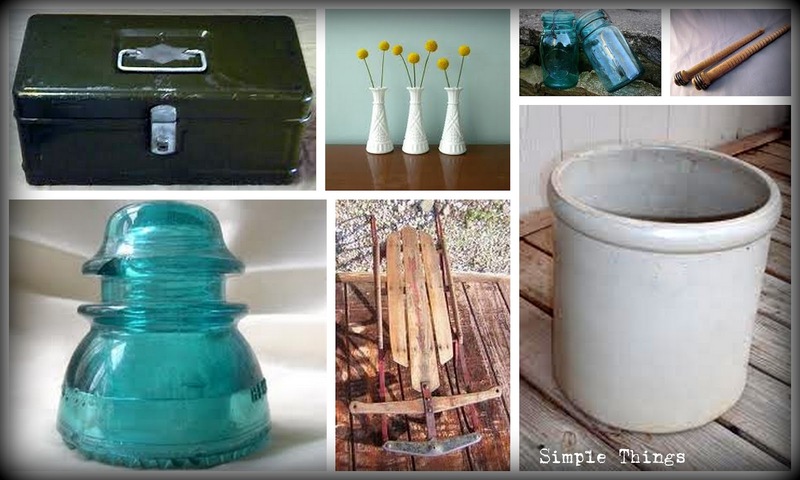 I came away with a few great treasures and all for under $50.00. Let's just say I plan on returning very soon, for some more. Just a sampling of some of my treasures I purchased. Not my actual ones as they are already distributed in my home, and storage for future, so I clipped a few off Google just so you get the idea. A few things are missing, and I can't believe I scored it all for such great price, my bestest trip in a long time. Hope everyone is doing great out there, and all are healthy. Hope Father's day went well, I cooked our favourite, most yummy pasta dish and enjoyed cheesecake with the fam. Another of hubby's faves. Gotta get back on track and stop eating such yummy treats. Will chat soon I promise.